The Voyager balloon Cappadocia ride is minimum one hour and we will fly over all rock formations to several thousand feet. 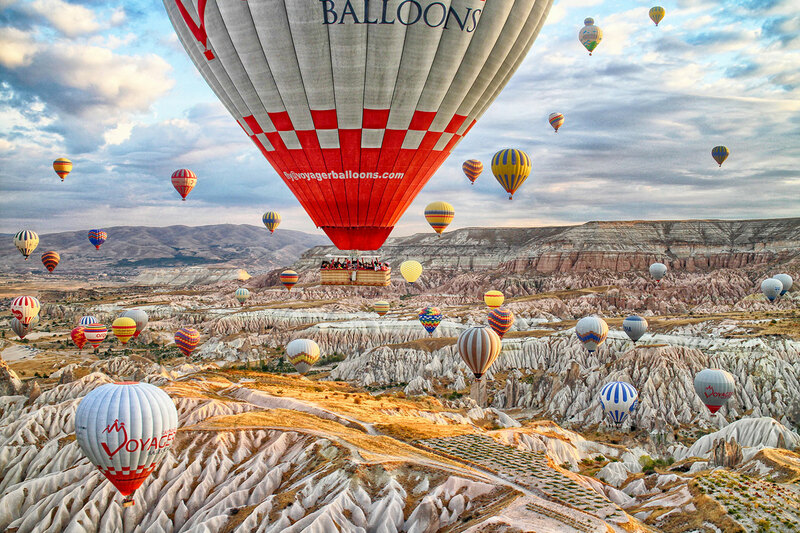 when you’re airborne balloon pilot will point and inform the spectacular sites of Cappadocia, from Red Valley to the Goreme and vineyards to cappadocia rock formations while watching the beauty of the nature. Our flying region has many wonderful things to see in Cappadocia.Depending on the number of the people that sign up for the standard balloon ride, we use basket with a capacity of 20 people. The Balloon ride will be at least 60 minutes and entire balloon adventure lasts about 2.5 hours. Voyager balloon company makes your transfer with good condition mini buses from your hotel to our restaurant one hour before the sunrise. Voyager balloon office will inform you the day before about the pick-up time for Balloon ride in the morning from your hotel. While Voyager Balloons pilots are choosing departing point of in the region, you will have an open buffet – fully catered breakfast in our restaurant. We have a proper indoor place to enjoy early breakfast. Simply, you are free of winds, dust and cold. Cups of coffee or teas will go well with traditional pastry as well as cheese, olives, cake, sausages etc.After the decision of departure point of site by our pilots, we transfer the passengers. To offer the best possible flight and the experience, we choose the take-off site for the day’s flight according to the direction and the strength of the wind. One of life’s most fascinating sights is the set-up and inflation of a hot air balloon. Once the balloon is stabilised, the passengers receive their call and the adventure begins. Before take-off , your pilot will brief you about safety procedures. Please listen carefully and follow all of your pilot’s instructions.The feeling of ballooning is very gentle and its calming effect seems to put the world below into perspective. Rock formations and world-famous fairy chimneys drift into view, giving you an unmatched feeling of being above it all.Your pilot can turn the balloon using the rotation vents and provide you with a full panoramic view as you glide through the skies. After the flight, when your feet find their way back to earth, the crew will meet you, and help you celebrate your voyage with the traditional champagne toast and memories to last a lifetime. We give you a commemorative flight certificate suitable for framing, and memories to last a lifetime.